HomeEditorialWhat, Exactly, Are We Doing Here? 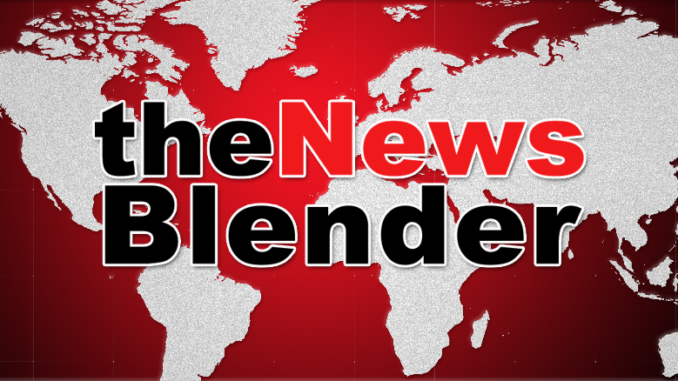 The News Blender Logo. Photo By Lenny Ghoul. In light of recent events, we felt it was a good idea to refresh and refine what the overall vision is for TNB and the path to follow in order to achieve that vision. Due to a couple of recent incidents, and through the ensuing discussions, we found that there was some disagreement on that even within the ranks of the five founders of the site. As most of you are aware, this has resulted in the unfortunate decision by Lenny to step away from the operation of TNB. It was a voluntary decision by Lenny. He was not forced out and he was not asked to leave. He is still very much liked and respected by all of us and we sincerely hope he will remain a member of the TNB community and maybe once again contribute in some capacity in the future. It essentially boiled down to a disagreement on that vision. Each of us are doing this on a voluntary basis, using up a lot of our free time. Therefore, it is essential that we fully believe in, enjoy, and buy into what we’re working toward. Lenny made the decision that the path we wanted to take was not the best one for him. I respect and understand that decision. To be honest, I too was prepared to step down and seek another avenue for my ideas and writings, had the team decided to go the other way. So, what exactly is that vision for TNB? All of the founders and most of the contributors to TNB lean conservative, with a very heavy emphasis on the Constitution and the principles that are behind it. We wanted to create an environment that facilitated learning about those pillars of our founding and put them into practice through civil discourse. One of the most basic principles of our Republic is that it is a system of self-government where the people are sovereign…meaning that the people are the final arbiters of what happens. In order for that self-government to work, it is the people that need to be able to, and be willing to, discuss the important issues with each other in a civil and respectful manner. We are attempting to create and facilitate that very thing. We have all been visitors of other political websites around the internet and most of us have participated in the discussions at those sites. There is a common theme that almost all of them share. That is, they are filled with many people who have no intention and no desire to participate in any type of mutually respectful dialogue. They are there strictly to argue their partisan points and disparage anyone who does not agree with them. The comments are a cesspool of incessant arguing, name calling, and bickering between a lot of ignorant people. If you are anything like me, you’ve jumped from site to site searching for one that is better…one where you can have rational, respectful discussions and debate with equally rational and respectful others. We’re not trying to be like the rest. We’re not simply working to obtain as many visitors and clicks as we can in order for us to bring in as much revenue as we can. Because that’s why all of those sites turn into such chaotic circuses…the clickbaity articles get clicked, and the resulting arguments work people into a frenzy and create more clicks. In the end, nothing productive is achieved. Rather, it’s more trash being delivered and talking points being disseminated and divisions being forged and hardened. We are trying to create something different. And we hope that the TNB community that is developing will want to help us create it. Ok, Steve, but what does that mean? Part of it is to offer content that is not intended to be blatantly divisive. We are not in search of liberal tears. We’re not interested in spending massive amounts of time highlighting some fringe person on the left and pretending that’s how everyone that votes for Democrats is. When we present news items, we make a very concerted effort to present it in a neutral way, including all of the facts, whether that benefits the left or the right. Facts are facts, and none should be left out simply because it harms the narrative of one side or the other. Of course, as far as our editorial writings go, it’s obvious that much of that is focused on President Trump and our disagreements with him and those who are sycophanting for him. Due to this, we have become seen as a NeverTrump site. But from the beginning, we all agreed that we did not want to be just a NeverTrump site, which is why we offer the various types of content, from the strange to the humorous, as well as a varied selection of news items. But we can’t just ignore Trump. He is what drives most of the news at this time, and he is what everyone wants to talk about. Therefore, we try to present our thoughts on Trump and Trump’s actions from a constitutionally conservative viewpoint, based on sound, long-held principles. The other part of our mission revolves in how we build the community. We have decided that we do not want to try to attract anyone and everyone just for the sake of increasing our numbers. Rather, we want to attempt to have a controlled growth, building our community with those who truly want to be a part of something different, something better. People who are open to real civil discourse. People who are willing to listen, consider, think critically and disagree respectfully among the friendly community banter. In a nutshell, it is the idea behind our “Don’t Be A Jerk” (DBAJ) comment policy. We want to attempt to keep the jerks out of the TNB community. Yes, we are being snobby that way. However, jerks disrupt, disrespect, and destroy tranquility and if they are allowed to infest a community, it will become a chaotic crapshow, just like every other site out there. And let’s be honest, nobody likes a jerk and we don’t believe our community should have to suffer them. They add no value to any discussion and, in fact, detract from it. Therefore, there is no reason to keep them around, once it is determined that they are, indeed, a jerk and refuse to quit being a jerk. The question then becomes, what is a jerk? How do we define it? In the same way, I cannot define everything that would make someone a jerk, but I know it when I see it. Yes, that is subjective, and you and I may not agree on every instance of jerkiness. But that does not mean that we should not attempt to identify it and take action against it. When there are disagreements, we merely need to have a process to resolve those disagreements. For regular, daily, routine moderation in the comments, moderators will use their best, individual judgment as to whether someone needs to be nudged a bit, or when a more blatant action occurs (obvious name calling, slurs, or direct personal attacks, etc) where a more forceful warning is warranted. On rare occasions, an outright ban may be necessary. We have decided that the best way to do that is that when it comes down to a final judgement as to whether a particular person is a good fit for the TNB community, in light of all of the goals that I have outlined above, the moderators will take a vote, and the majority vote will decide it. We expect that our visitors will be mature and adult enough to be able to also police themselves on jerkiness (note that does not mean you should call out others, leave that to the mods). Those who are not able to police themselves will tell us a great deal about whether they are the type of member we want for our community. This does not mean that we want an echo chamber of only people that agree with each other. On the contrary, we want to encourage those with differing viewpoints to converse together and listen to each other and learn from each other, without the distraction of jerks simply tossing bombs in and running. This does not mean that simply disagreeing with the general viewpoint of the community or of the mods or site owners signifies that you are a jerk. It’s the way in which that person presents themselves and their viewpoints and how they interact with other community members which will determine that. In order to determine that, we need to be able to observe things for a little bit in order to give everyone a fair chance to show it. This does not mean that those who support Trump, or Hillary, or Obama, or any other of our political leaders is automatically a jerk. Again, we want to give everyone an equal chance at becoming a civil, respectful member of the community. The only people that we are discriminating against is those that we determine are jerks, whether they are Trump supporters, NeverTrumpers, Hillary fans, or otherwise. Until the moderators can make a determination, we would appreciate if all of our regulars help us out by being exceptionally friendly and civil to all new visitors. Yes, we would like you all to make in extra effort in that. Shower them with kindness and friendliness. Why? Because we do not want our determination to be tainted by whether or not these people may have been incited to react negatively towards us. If they are immediately piled on and accused of being a Russian right away, that will definitely affect the way they react and respond in kind. So, we want to eliminate that factor in the equation. Please allow them to fully reveal themselves without any influence from us. If they rub you the wrong way right away and you can’t find yourself able to shower friendliness, please simply ignore or block them until we are able to handle the situation. I assure you that we are watching it and will take action. We have every intent on attempting to keep our community free from jerks. But we need your cooperation in that endeavor. Is this vision even possible? Are we being naive to think that we can create such a Utopian community on the internet? Very possibly, we may be naive. It may indeed by pie in the sky. It may fail miserably. In fact, knowing the internet, it’s likely to. But we believe it is worth a try. We believe that there really are millions of people that fit into our vision. We believe that 70% of the people are rational, reasonable people, capable of rational, reasonable, respectful discussion. It’s those other 15% on the edges of each side that we are attempting to keep out. Those 30% that are unreachable, no matter what reason and facts, and evidence you use, they will stick to their ignorant talking points to the very end of the Republic. And they will be jerks. They are a waste of time and effort. They need to be shunned and ignored. They are not going to be a part of fixing this Republic. That’s up to the rest of us.